In these videos, both Gareth Bale and John Terry trained on sandpit ground as a means of recovery process of return to play procedure from their injuries. The video of Gareth Bale was posted earlier this year. It seems that Real Madrid is continuously using the sandpit as one of their special training surfaces for training and recovery, based on the two previous videos which were recorded in two year time frame. What is so special about sand training that Real Madrid keeps on using for their players? Running on sand requires greater energy and effort out of athletes compared to firmer surfaces like grass. Pinnington and Dawson (2001) compared the energy cost (EC) of running on grass and soft dry beach sand with and without shoes at different speed. They found that there were no differences between having shoes or bare feet for running on the sand, but both showed about 1.5 times greater net aerobic EC, around 2.5 times net anaerobic EC, and 1.5 times net total EC. Higher energy cost means that it is cost effective over a given training period. Due to the higher EC stimulus, sand training may promote greater physiological adaptations for the same duration of time compared to the firmer grounds. Findings from Binnie, Dawson, Pinnington, Landers, and Peeling (2013b) showed that sand trained group had significantly higher blood lactate and heart rate responses compared to grass trained group. Athletes also reported higher RPEs training on the sand. The unique nature of soft surface creates high shock absorptive quality which lowers the impact on the body. The reduced impact on the body is achieved by providing significantly lower peak deceleration forces on ground contact by sand surface compared to firmer grounds (Binnie et al., 2013a). This exclusive feature of the surface has benefits particularly with plyometric exercises. To borrow words from Mike’s blog on plyometrics, it involves a collision between the body and the ground. The magnitude of the impact at ground contact determines the intensity of the exercises. For the most part, the higher the intensity of the plyometric exercise, the more impact the body feels based on the Newton’s third law of motion – for every action, there is an equal and opposite reaction. For example, in depth jump, if athlete falls from higher box, the landing on the ground will have greater velocity creating higher reactive impact on the body. The sand creates an exception. Due to the shock absorptive quality, the peak deceleration force on ground contact is dissipated and the reactive impact on body is reduced. Therefore, sand training would be of great use for low impact weight bearing exercises. The low impact on body means that the body feels less stress which lowers the risk of overuse injuries. The reduced impact on body provides less stress which helps to diminish the likelihood of injuries. The risk of overuse injuries rises when the athletes are continuously exposed to the same stressors. Also, having sand training occasionally would add variety in training for athletes which deliver different stress on athletes from ordinary training ground (grass, court, etc.). This variety in training also reduces likelihood of overuse injuries. Studies from Impellizzeri et al. (2008) investigated the effect of plyometric training on sand versus grass on muscle soreness, jumping, and sprinting abilities in soccer players. Over the course of 4 weeks of plyometric training on both surfaces, the group trained on the sand reported less muscle soreness throughout the whole training period compared to the grass group. It is identified that the sand training reduces the level of muscle damage, muscle soreness, and performance capacity relative to exercise intensity (Binnie et al., 2014). The question regarding the performance improvement is whether sand training has better or at least the similar effect as training from the ordinary firmer training ground like grass or courts. As discussed above, sand training demands higher energy cost from athletes compared to the firmer grounds providing greater physiological adaptation to performances like aerobic fitness. Study from Amrinder, Sakshi, and Singh (2014) reported that the 4 weeks of plyometric training on grass and sand had no significant differences in their performance improvement on tested variables (isokinetic strength and endurance, static balance, and agility), but sand training group experienced less muscle soreness. Binnie et al. (2013a) also informed that 8-week pre-season training on grass and sand resulted in similar improvement for 20m sprint times. Impellizzeri et al. (2008) also compared the performance gains from two different surfaces, sand and grass, after 4 weeks of plyometric training. The result showed that there were no significant interactions for 10m and 20m sprint time, but sand group had superior enhancement on squat jump performance while grass group had significantly better result on countermovement jump and eccentric utilization ratio (CMJ/SJ). Based on different researches, there seems to be similar benefits from sand training and grass training on plyometric training for short distance sprint performances. There are, however, some aspects of sand training that might not be suitable for specific performance variables. Although the soft and high shock absorptive nature of sand surface provides low impact to body, there is a concern that these benefits may be offset by having reduced stride length causing increased number of foot contact while running on sand. For plyometric session that is structured to a fixed number of foot contacts, the benefits of low impact sand surface could be maximized. Running or interval sessions that are designed for time or distance, the low impact qualities may be offset by having greater number of foot contacts. Since the sand bogs down the foot on ground contact, the ground contact time becomes longer than that of grass. Because of this reason, the type of training and exercises need to be chosen carefully. For sprinting, both stride length and frequency is important as well as the ground contact time to run fast. The effects of sand on these movement qualities, however, are opposite to what we aim to achieve through training. In order to run fast, the stride length should be maximized and ground contact time should be minimized. Thus, sprinting type of exercises is not recommended on the sand. However, sand may have a value to build first steps of power development in sprinting as this phase of sprinting has relatively longer ground contact time compared to the top-end speed phase. As briefly discussed above on the findings from Impellizzeri et al. (2008), the sand surface had greater improvement on squat jump performances whereas grass surface had superior enhancement on countermovement jump performances. It explains that the neuromuscular adaptations from training are surface dependent. 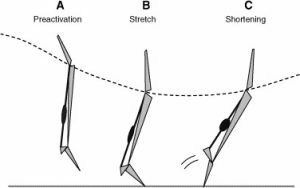 The performance qualities that involve stretch-shortening cycle should be trained on firmer ground which enhances the stretch loads of elastic energy to maximize stretch-reflex qualities. I know I have said that sand training reduces the likelihood of overuse injuries. There are, however, some concerns of risks of injuries due to the unstable surface. On the other hand, some suggest that these unstable surfaces strengthen the stabilizer muscles and ligaments in lower extremities. The duality of the unstable surface may need to be considered before choosing sand training. To summarize, sand training has its own value to benefit athletes in a specific way. Many studies suggest that sand training could be incorporated particularly into a team sport pre-season training for interval running and sport-specific conditioning sessions. Sand training is also a viable alternative particularly during more intensified period of the season to minimize impact force induced stress on body. 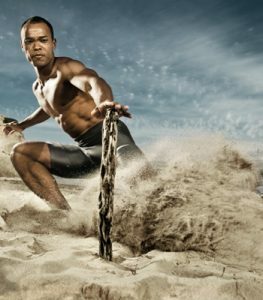 Another use of sand training that is suggested is for athletes returning from injury as shown in the videos at the beginning of this article. The low impact and stress on body could be used as a good initial stage to progress from. The coaches need to implement sand training wisely to maximize its benefit for the athletes. Binnie, M. J., Dawson, B., Pinnington, H., Landers, G., & Peeling, P. (2013a). Effect of surface-specific training on 20-m sprint performance on sand and grass surfaces. Journal of Strength and Conditioning Research, 27(12), 3515-3520. Binnie, M. J., Dawson, B., Pinnington, H., Landers, G., & Peeling, P. (2013b). Effect of training surface on acute physiological responses after interval training. Journal of Strength and Conditioning Research, 27, 1047-1056. Binnie, M. J., Dawson, B., Pinnington, H., Landers, G., & Peeling, P. (2014). Sand training: a review of current research and practical applications. Journal of Sports Sciences, 32(1), 8-15. Impellizzeri, F. M., Rampinini, E., Castagna, C., Martino, F., Fiorini, S., & Wisloff, U. (2008). Effect of plyometric training on sand versus grass on muscle soreness and jumping and sprinting ability in soccer players. British Journal of Sports Medicine, 42, 42-46. Pinnington, H. C., & Dawson, B. (2001). The energy cost of running on grass compared to soft dry beach sand [Abstract]. Journal of Science and Medicine in Sport, 4(4), 416-430.